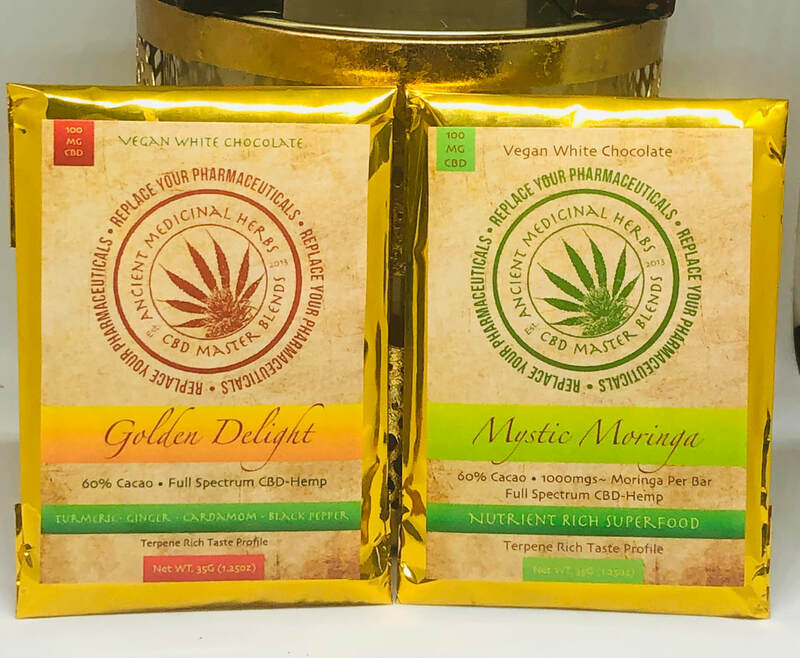 Golden Delight & Mystic Moringa! Already a favorite to some, soon to be many! Based on the Ayurvedic “Golden Milk” formulas, we’ve combined Turmeric, Ginger, Cardamom, Black Pepper, and CBD to bring you a most deliciously delightful white chocolate bar that’s one of a kind in the market. This is a true medicinal chocolate bar, with benefits that could fill pages. This special treat is born out of the collaboration of Ancient Medicinal Herbs LLC and Moringa Lion. We've collaborated to bring to you the first of its kind ~ the perfect marriage of the highly regarded superfood Moringa Oleifera and Cannabidiol (CBD). This bar is a truly nourishing SUPERFOOD treat. Mystic Moringa is packed with an array of vital nutrients to maintain balanced health, and full spectrum CBD to nourish the endocannabinoid system. Order yours and tell us what you think! 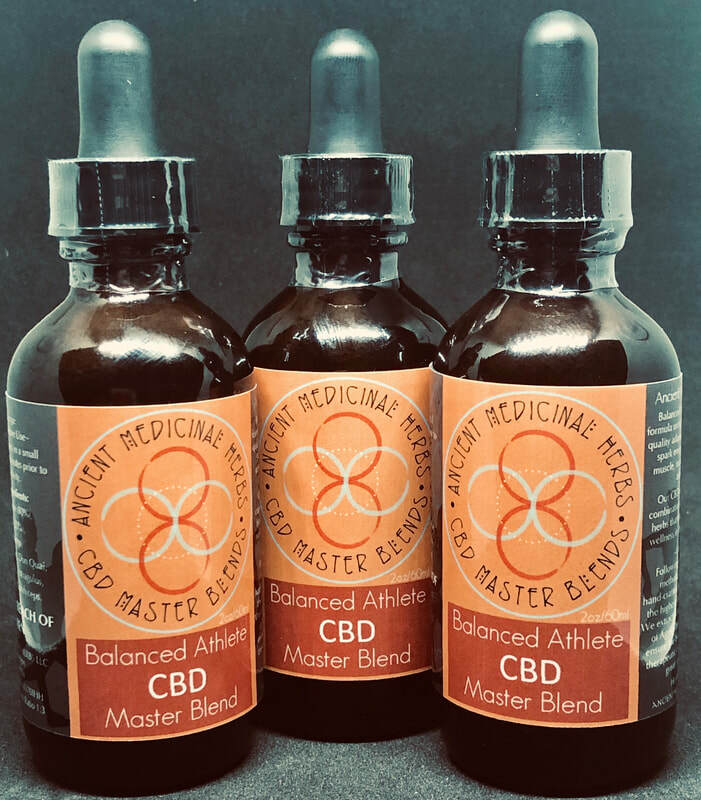 Full Spectrum CBD and Adaptogen Formula designed to spark energy, endurance, build muscle, improve cardiac and lung capacity and aid in recovery. Adaptogens are a class of botanicals that balance the physical and mental response to stress and its effects on the body. All while building energy reserves and allowing the body to adapt to rigorous training routines. Resulting in both increased output and decreased recovery time. 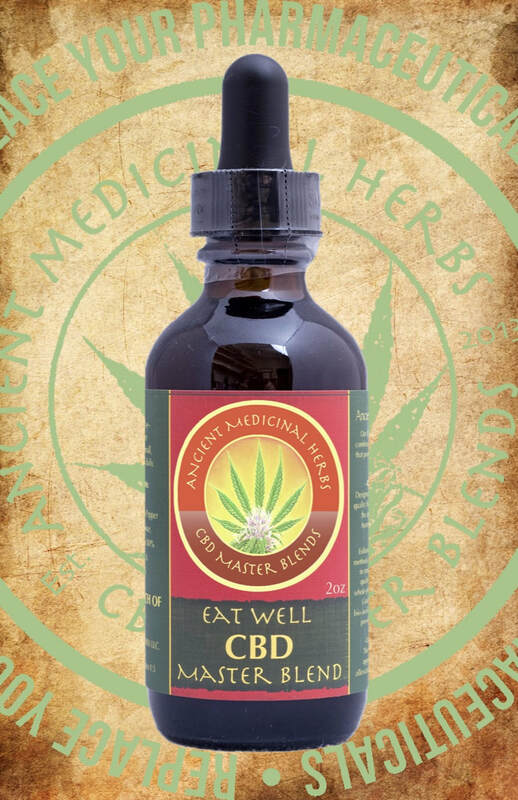 Eat Well CBD Master Blend is crafted as the ideal remedy for enhancing appetite, igniting agni (metabolic fire), digestion support, Irritable Bowel Syndrome (IBS), and for alleviating gas and nausea. * Combining CBD Elixir with Peppermint, Ginger, Cardamom, Fennel, etc., this formula is your go-to remedy for pre, and post digestive complaints. ​Drinking True Alkaline Water made by my DYLN Living Water Bottle has been a major part of my healing process and recovery from curing cancer. This is my go-to water bottle for deep hydrating nourishment of the cells and for cancer prevention, etc. Once I experienced its amazing benefits firsthand, I purchased a bottle for each of my family members! I now wish to share such benefits with YOU! Click the link to order yours and feel good about lowering your impact on our oceans by making steps toward eliminating plastics. ​Join me in the healing ourselves and our planet! 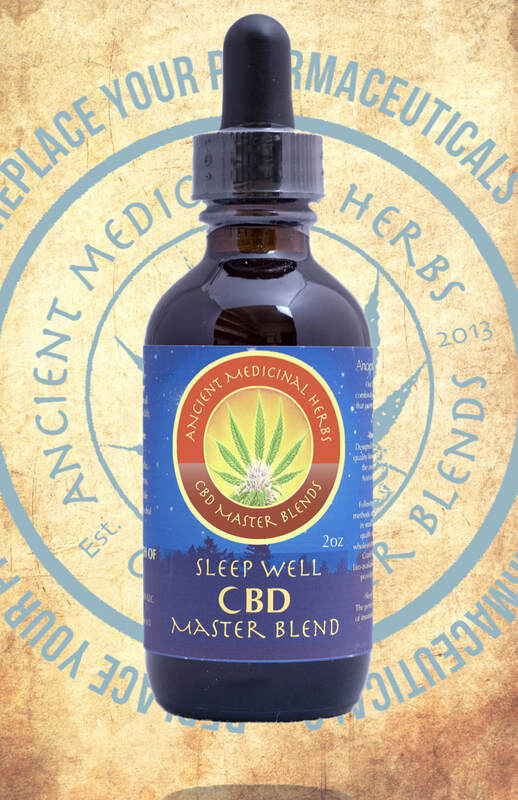 Try our Highly Effective CBD Master Blends Today! 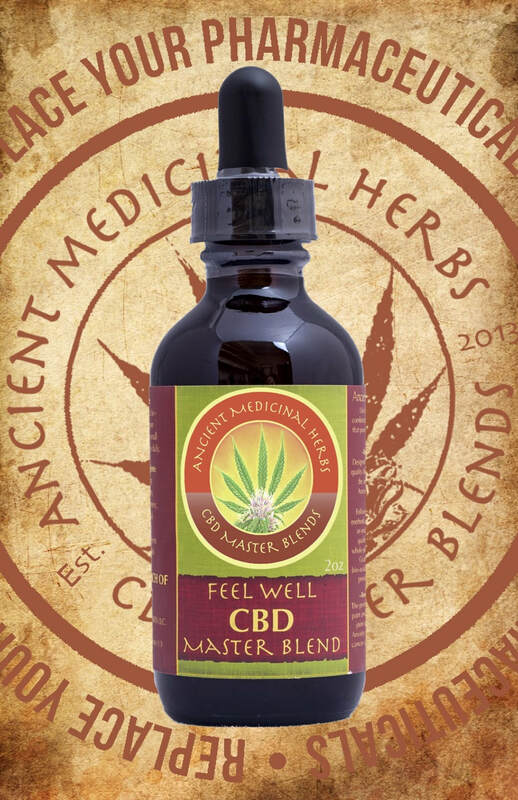 Our CBD Master Blends produces no psychoactive effect, and are strictly therapeutic, meeting the national compliances as a CBD Rich tincture. After years of refining our knowledge in practice of the healing art of herbal medicine, we feel that it was vital to formulate the most comprehensive remedies that are safe and effective for the alleviation of ailments, with the wise use of medicinal cannabis. Handcrafted in small batches, we use the highest quality organic botanicals to create our CBD Master Blends. Our formulations are based in the Wholistic Healing Traditions of Ayurveda, and Chinese Medicine. Here at Ancient Medicinal Herbs LLC, we are taking a revolutionary path in the ‘Medical Marijuana Community’, by producing CBD-Rich remedies the way they were originally made, in an era where this approach has long been forgotten and ignored. In the ancient healing traditions, cannabis was rarely used as an isolated medicine as its used today. Herbalists of the past knew that when you combine cannabis with other healing herbs, a synergistic effect would make their remedies more potent and effective. It is well known that cannabis has the power to enhance the attributes of other medicinal plants and vice-versa. We have crafted our CBD Master Blends with this exact knowledge and skill in mind. What's the difference between Agricultural Grade Hemp and Marijuana?